Casey Daniels is a penname used by Connie Laux, who writes thrillers for children. She has a degree in English, experience as a journalist and writing teacher, and lots of ideas for more Pepper Martin mysteries. When she’s not writing, she’s usually with her family and two dogs, Ernie, an adorable Airedale pup, and Oscar, a rescued Jack Russell who spends far too much time watching TV. 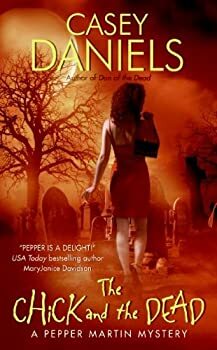 Daniels enjoys knitting, gardening and of course, stomping through cemeteries in search of history, stories and inspiration. Learn more at Casey Daniel’s website. Pepper Martin Mysteries — (2006-2012) Publisher: She sees dead people. Beautiful, smart, and chic, Pepper Martin never had to work a day in her life — until her surgeon daddy was convicted of fraud, her wealthy fiancé took a powder, and the family fortune ran bone dry. Suddenly desperate, the inexperienced ex-rich girl was forced to take the only job she could get: as a tour guide in a cemetery. But a grave situation took a turn for the worse when a head-on collision with a headstone left her with an unwanted ability to communicate with the disgruntled deceased… and now Pepper has a whacked Mafia don demanding that she hunt down his killers — and threatening to haunt her until she does. Former rich girl Pepper Martin, reduced to dire financial straits, takes a job as a cemetery tour guide. When she falls and hits her head on late mobster Gus Scarpetti's mausoleum, she gains the (rather inconvenient) ability to see Gus's ghost. Gus enlists Pepper to solve the decades-old mystery of his murder. While trying to get to the bottom of the case, Pepper learns that a ghostly "boss" can be hazardous to a girl's love life and job prospects, and maybe even her life itself. I was often annoyed by Pepper. She's ditzy, she's obsessed with her own bust size, and she needs a lot of rescuing. However, Gus is more obnoxious still. Their bickering is sometimes funny and sometimes irritating. Some of my favorite moments were when Pepper read Gus the riot act. Pepper Martin thought her newly acquired ability to see ghosts was a one-shot deal. That once Gus Scarpetti moved on to the great hereafter, she could go back to her normal life where only the living talked to her. She was wrong. It seems Gus has been talking her up in the afterlife, and sends Didi Bowman her way.